GQA are delighted to welcome Andy Carrington as the newest member to join our team. He joins us from Derby College and brings with him a wealth of experience and knowledge. Andy has been in the industry for 30 years and has had various job roles from Glass and Glazing maintenance to Surveying and Management. He also has vast experience within the assessment and verification process of GQA qualifications. Within his previous job, Andy was nominated and won the GQA Best Practice in Assessment Award at the 2011 GQA Conference. Andy will focus primarily on Fenestration, working with GQA Approved centres to provide support on Fenestration linked qualification and programmes, including MTC compliance solutions. Andy says, “My strengths are my knowledge of the industry and experience of assessment and verification and I look forward to the challenge to improve on what GQA has already achieved and to working closely with other industry bodies”. 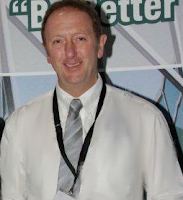 Mick Clayton, CEO of GQA said, “Andy is a fantastic addition to the team, I have known Andy personally for many years and his experience, endeavour and personality will be an asset to GQA and our centres”. Andy is joining a team of 9 External Verifiers who work throughout the UK, providing a strong support network for over 70 GQA approved centres offering our qualifications.